Kitchen Simmer: It's Curry and Comfort's 4th Birthday!! It's Curry and Comfort's 4th Birthday!! Today I celebrate with a slice of cake and a heart full of gratitude. 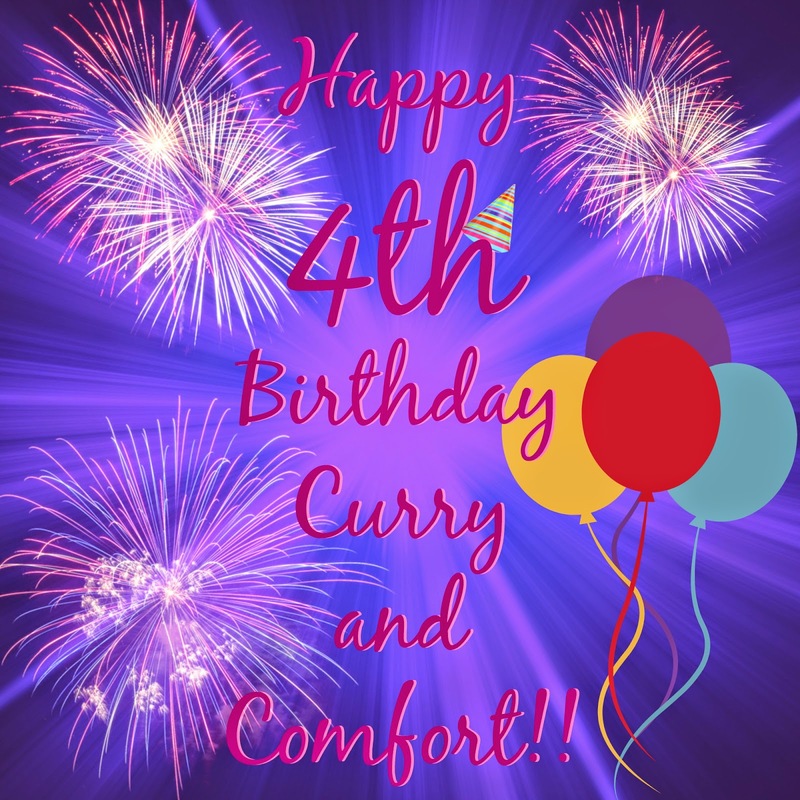 It's been four fabulous years cooking and blogging here at Curry and Comfort. I have met so many wonderful fellow bloggers, cooking fans and friends through the years. It's like having a whole new family thanks to my blog. Cooking has always been something fun for me to do, but it's truly taken over as one of my greatest passions in life. I am so grateful for every day I get to share a little piece of love from my kitchen here on the blog. I am so thankful to my recipe tasters... my family! They get to eat all the food I cook, but sometimes they have to wait a little while so I can photograph it first. Every food blogger knows that the photo is the proof in the pudding... without those wonderful photos to drool over our recipes would not be the same. Thank you for being so patient with me...I could not do this every day without your hungry belly's helping me eat all that food. Thank your for everything... from the bottom of my heart. You are my first teacher and my inspiration in the kitchen. Thank You! You have made me have four fabulous years here at Curry and Comfort. I hope for many, many more years of blogging, cooking and enjoying my little space here on the internet. Happy Happy Bloggy Birthday!! Here is to another 4 years! Congrats Ramona!! An awesome bloggy birthday to be sure! :D Keep up the great work! A great post for celebrating your 4th year!!! HAPPY BIRTHDAY! I read your post everyday! I am learning a lot and cooking a lot! My best wishes to you for continued success! Congrats on four years of delicious-ness! Looking forward to many more!